Data science teams need people with the skills and curiosity to ask the big questions. “What makes a data scientist” section of this report for the story on how we came up with the title “Data Scientist”). Since then, data science has taken on a life of its own. The hugely positive response to “What Is Data Science?,” a great introduction to the meaning of data science in today’s world, showed that we were at the start of a movement. There are now regular meetups, well-established startups, and even college curricula focusing on data science. 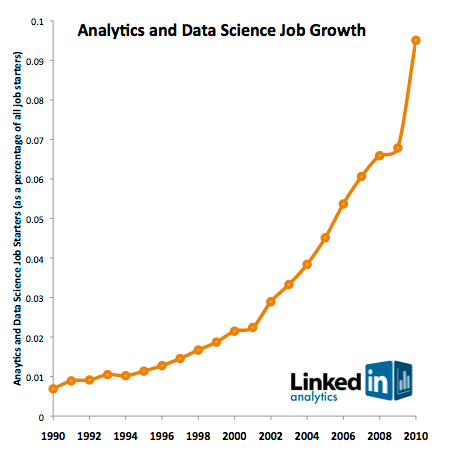 As McKinsey’s big data research report and LinkedIn’s data indicates, data science talent is in high demand. This increase in the demand for data scientists has been driven by the success of the major Internet companies. Google, Facebook, LinkedIn, and Amazon have all made their marks by using data creatively: not just warehousing data, but turning it into something of value. Whether that value is a search result, a targeted advertisement, or a list of possible acquaintances, data science is producing products that people want and value. And it’s not just Internet companies: Walmart doesn’t produce “data products” as such, but they’re well known for using data to optimize every aspect of their retail operations. Given how important data science has grown, it’s important to think about what data scientists add to an organization, how they fit in, and how to hire and build effective data science teams. There are many ways to assess whether an organization is data driven. Some like to talk about how much data they generate. Others like to talk about the sophistication of data they use, or the process of internalizing data. I prefer to start by highlighting organizations that use data effectively. Ecommerce companies have a long history of using data to benefit their organizations. Any good salesman instinctively knows how to suggest further purchases to a customer. With “People who viewed this item also viewed …,” Amazon moved this technique online. This simple implementation of collaborative filtering is one of their most used features; it is a powerful mechanism for serendipity outside of traditional search. This feature has become so popular that there are now variants such as “People who viewed this item bought … .” If a customer isn’t quite satisfied with the product he’s looking at, suggest something similar that might be more to his taste. The value to a master retailer is obvious: close the deal if at all possible, and instead of a single purchase, get customers to make two or more purchases by suggesting things they’re likely to want. Amazon revolutionized electronic commerce by bringing these techniques online. Data products are at the heart of social networks. After all, what is a social network if not a huge dataset of users with connections to each other, forming a graph? Perhaps the most important product for a social network is something to help users connect with others. Any new user needs to find friends, acquaintances, or contacts. It’s not a good user experience to force users to search for their friends, which is often a surprisingly difficult task. At LinkedIn, we invented People You May Know (PYMK) to solve this problem. It’s easy for software to predict that if James knows Mary, and Mary knows John Smith, then James may know John Smith. (Well, conceptually easy. Finding connections in graphs gets tough quickly as the endpoints get farther apart. But solving that problem is what data scientists are for.) But imagine searching for John Smith by name on a network with hundreds of millions of users! Although PYMK was novel at the time, it has become a critical part of every social network’s offering. Facebook not only supports its own version of PYMK, they monitor the time it takes for users to acquire friends. Using sophisticated tracking and analysis technologies, they have identified the time and number of connections it takes to get a user to long-term engagement. If you connect with a few friends, or add friends slowly, you won’t stick around for long. By studying the activity levels that lead to commitment, they have designed the site to decrease the time it takes for new users to connect with the critical number of friends. Netflix does something similar in their online movie business. When you sign up, they strongly encourage you to add to the queue of movies you intend to watch. Their data team has discovered that once you add more than than a certain number of movies, the probability you will be a long-term customer is significantly higher. With this data, Netflix can construct, test, and monitor product flows to maximize the number of new users who exceed the magic number and become long-term customers. They’ve built a highly optimized registration/trial service that leverages this information to engage the user quickly and efficiently. Netflix, LinkedIn, and Facebook aren’t alone in using customer data to encourage long-term engagement — Zynga isn’t just about games. Zynga constantly monitors who their users are and what they are doing, generating an incredible amount of data in the process. By analyzing how people interact with a game over time, they have identified tipping points that lead to a successful game. They know how the probability that users will become long-term changes based on the number of interactions they have with others, the number of buildings they build in the first n days, the number of mobsters they kill in the first m hours, etc. They have figured out the keys to the engagement challenge and have built their product to encourage users to reach those goals. Through continued testing and monitoring, they refined their understanding of these key metrics. Receive results faster with Aster Data’s approach to big data analytics. Learn more. Google and Amazon pioneered the use of A/B testing to optimize the layout of a web page. For much of the web’s history, web designers worked by intuition and instinct. There’s nothing wrong with that, but if you make a change to a page, you owe it to yourself to ensure that the change is effective. Do you sell more product? How long does it take for users to find the result they’re looking for? How many users give up and go to another site? These questions can only be answered by experimenting, collecting the data, and doing the analysis, all of which are second nature to a data-driven company. Yahoo has made many important contributions to data science. After observing Google’s use of MapReduce to analyze huge datasets, they realized that they needed similar tools for their own business. The result was Hadoop, now one of the most important tools in any data scientist’s repertoire. Hadoop has since been commercialized by Cloudera, Hortonworks (a Yahoo spin-off), MapR, and several other companies. Yahoo didn’t stop with Hadoop; they have observed the importance of streaming data, an application that Hadoop doesn’t handle well, and are working on an open source tool called S4 (still in the early stages) to handle streams effectively. Payment services, such as PayPal, Visa, American Express, and Square, live and die by their abilities to stay one step ahead of the bad guys. To do so, they use sophisticated fraud detection systems to look for abnormal patterns in incoming data. These systems must be able to react in milliseconds, and their models need to be updated in real time as additional data becomes available. It amounts to looking for a needle in a haystack while the workers keep piling on more hay. We’ll go into more details about fraud and security later in this article. Google and other search engines constantly monitor search relevance metrics to identify areas where people are trying to game the system or where tuning is required to provide a better user experience. The challenge of moving and processing data on Google’s scale is immense, perhaps larger than any other company today. To support this challenge, they have had to invent novel technical solutions that range from hardware (e.g., custom computers) to software (e.g., MapReduce) to algorithms (PageRank), much of which has now percolated into open source software projects. Instrumenting and collecting as much data as you can. Whether you’re doing business intelligence or building products, if you don’t collect the data, you can’t use it. Measuring in a proactive and timely way. Are your products, and strategies succeeding? If you don’t measure the results, how do you know? Fostering increased curiosity about why the data has changed or is not changing. In a data-driven organization, everyone is thinking about the data. It’s easy to pretend that you’re data driven. But if you get into the mindset to collect and measure everything you can, and think about what the data you’ve collected means, you’ll be ahead of most of the organizations that claim to be data driven. And while I have a lot to say about professional data scientists later in this post, keep in mind that data isn’t just for the professionals. Everyone should be looking at the data. In every organization I’ve worked with or advised, I’ve always found that data scientists have an influence out of proportion to their numbers. The many roles that data scientists can play fall into the following domains. Data has long played a role in advising and assisting operational and strategic thinking. One critical aspect of decision-making support is defining, monitoring, and reporting on key metrics. While that may sound easy, there is a real art to defining metrics that help a business better understand its “levers and control knobs.” Poorly-chosen metrics can lead to blind spots. Furthermore, metrics must always be used in context with each other. For example, when looking at percentages, it is still important to see the raw numbers. It is also essential that metrics evolve as the sophistication of the business increases. As an analogy, imagine a meteorologist who can only measure temperature. This person’s forecast is always going to be of lower quality than the meteorologist who knows how to measure air pressure. And the meteorologist who knows how to use humidity will do even better, and so on. Once metrics and reporting are established, the dissemination of data is essential. There’s a wide array of tools for publishing data, ranging from simple spreadsheets and web forms, to more sophisticated business intelligence products. As tools get more sophisticated, they typically add the ability to annotate and manipulate (e.g., pivot with other data elements) to provide additional insights. More sophisticated data-driven organizations thrive on the “democratization” of data. Data isn’t just the property of an analytics group or senior management. Everyone should have access to as much data as legally possible. Facebook has been a pioneer in this area. They allow anyone to query the company’s massive Hadoop-based data store using a language called Hive. This way, nearly anyone can create a personal dashboard by running scripts at regular intervals. Zynga has built something similar, using a completely different set of technologies. They have two copies of their data warehouses. One copy is used for operations where there are strict service-level agreements (SLA) in place to ensure reports and key metrics are always accessible. The other data store can be accessed by many people within the company, with the understanding that performance may not be always optimal. A more traditional model is used by eBay, which uses technologies like Teradata to create cubes of data for each team. These cubes act like self-contained datasets and data stores that the teams can interact with. As organizations have become increasingly adept with reporting and analysis, there has been increased demand for strategic decision-making using data. We have been calling this new area “decision sciences.” These teams delve into existing data sources and meld them with external data sources to understand the competitive landscape, prioritize strategy and tactics, and provide clarity about hypotheses that may arise during strategic planning. A decision sciences team might take on a problem, like which country to expand into next, or it might investigate whether a particular market is saturated. This analysis might, for example, require mixing census data with internal data and then building predictive models that can be tested against existing data or data that needs to be acquired. One word of caution: people new to data science frequently look for a “silver bullet,” some magic number around which they can build their entire system. If you find it, fantastic, but few are so lucky. The best organizations look for levers that they can lean on to maximize utility, and then move on to find additional levers that increase the value of their business. When Jeff Hammerbacher and I talked about our data science teams, we realized that as our organizations grew, we both had to figure out what to call the people on our teams. “Business analyst” seemed too limiting. “Data analyst” was a contender, but we felt that title might limit what people could do. After all, many of the people on our teams had deep engineering expertise. “Research scientist” was a reasonable job title used by companies like Sun, HP, Xerox, Yahoo, and IBM. However, we felt that most research scientists worked on projects that were futuristic and abstract, and the work was done in labs that were isolated from the product development teams. It might take years for lab research to affect key products, if it ever did. Instead, the focus of our teams was to work on data applications that would have an immediate and massive impact on the business. The term that seemed to fit best was data scientist: those who use both data and science to create something new. People often assume that data scientists need a background in computer science. In my experience, that hasn’t been the case: my best data scientists have come from very different backgrounds. The inventor of LinkedIn’s People You May Know was an experimental physicist. A computational chemist on my decision sciences team had solved a 100-year-old problem on energy states of water. An oceanographer made major impacts on the way we identify fraud. Perhaps most surprising was the neurosurgeon who turned out to be a wizard at identifying rich underlying trends in the data. All the top data scientists share an innate sense of curiosity. Their curiosity is broad, and extends well beyond their day-to-day activities. They are interested in understanding many different areas of the company, business, industry, and technology. As a result, they are often able to bring disparate areas together in a novel way. For example, I’ve seen data scientists look at sales processes and realize that by using data in new ways they can make the sales team far more efficient. I’ve seen data scientists apply novel DNA sequencing techniques to find patterns of fraud. What unifies all these people? They all have strong technical backgrounds. Most have advanced degrees (although I’ve worked with several outstanding data scientists who haven’t graduated from college). But the real unifying thread is that all have had to work with a tremendous amount of data before starting to work on the “real” problem. When I was a first-year graduate student, I was interested in weather forecasting. I had an idea about how to understand the complexity of weather, but needed lots of data. Most of the data was available online, but due to its size, the data was in special formats and spread out over many different systems. To make that data useful for my research, I created a system that took over every computer in the department from 1 AM to 8 AM. During that time, it acquired, cleaned, and processed that data. Once done, my final dataset could easily fit in a single computer’s RAM. And that’s the whole point. The heavy lifting was required before I could start my research. Good data scientists understand, in a deep way, that the heavy lifting of cleanup and preparation isn’t something that gets in the way of solving the problem: it is the problem. Working with large volumes of data despite hardware, software, and bandwidth constraints. Cleaning the data and making sure that data is consistent. Building rich tooling that enables others to work with data effectively. One of the challenges of identifying data scientists is that there aren’t many of them (yet). There are a number of programs that are helping train people, but the demand outstrips the supply. And experiences like my own suggest that the best way to become a data scientist isn’t to be trained as a data scientist, but to do serious, data-intensive work in some other discipline. Hiring data scientists was such a challenge at every place I’ve worked that I’ve adopted two models for building and training new hires. First, hire people with diverse backgrounds who have histories of playing with data to create something novel. Second, take incredibly bright and creative people right out of college and put them through a very robust internship program. Another way to find great data scientists is to run a competition, like Netflix did. The Netflix Prize was a contest organized to improve their ability to predict how much a customer would enjoy a movie. If you don’t want to organize your own competition, you can look at people who have performed well in competitions run by others. Kaggle and Topcoder are great resources when looking for this kind of talent. Kaggle has found its own top talent by hiring the best performers from its own competitions. Many people focus on hiring great data scientists, but they leave out the need for continued intellectual and career growth. These key aspects of growth are what I call talent growth. In the three years that I led LinkedIn’s analytics and data teams, we developed a philosophy around three principles for hiring and talent growth. Would we be willing to do a startup with you? Time: If we’re willing to do a startup with you, we’re agreeing that we’d be willing to be locked in a small room with you for long periods of time. The ability to enjoy another person’s company is critical to being able to invest in each other’s growth. Trust: Can we trust you? Will we have to look over your shoulder to make sure you’re doing an A+ job? That may go without saying, but the reverse is also important: will you trust me? If you don’t trust me, we’re both in trouble. Communication: Can we communicate with each other quickly and efficiently? If we’re going to spend a tremendous amount of time together and if we need to trust each other, we’ll need to communicate. Over time, we should be able to anticipate each other’s needs in a way that allows us to be highly efficient. Can you “knock the socks off” of the company in 90 days? Once the first criteria has been met, it’s critical to establish mechanisms to ensure that the candidate will succeed. We do this by setting expectations for the quality of the candidate’s work, and by setting expectations for the velocity of his or her progress. First, the “knock the socks off” part: by setting the goal high, we’re asking whether you have the mettle to be part of an elite team. More importantly, it is a way of establishing a handshake for ensuring success. That’s where the 90 days comes in. A new hire won’t come up with something mind blowing if the team doesn’t bring the new hire up to speed quickly. The team needs to orient new hires around existing systems and processes. Similarly, the new hire needs to make the effort to progress, quickly. Does this person ask questions when they get stuck? There are no dumb questions, and toughing it out because you’re too proud or insecure to ask is counterproductive. Can the new hire bring a new system up in a day, or does it take a week or more? It’s important to understand that doing something mind-blowing in 90 days is a team goal, as much as an individual goal. It is essential to pair the new hire with a successful member of the team. Success is shared. This criterion sets new hires up for long-term success. Once they’ve passed the first milestone, they’ve done something that others in the company can recognize, and they have the confidence that will lead to future achievements. I’ve seen everyone from interns all the way to seasoned executives meet this criterion. And many of my top people have had multiple successes in their first 90 days. In four to six years, will you be doing something amazing? What does it mean to do something amazing? You might be running the team or the company. You might be doing something in a completely different discipline. You may have started a new company that’s changing the industry. It’s difficult to talk concretely because we’re talking about potential and long-term futures. But we all want success to breed success, and I believe we can recognize the people who will help us to become mutually successful. I don’t necessarily expect a new hire to do something amazing while he or she works for me. The four- to six-year horizon allows members of the team to build long-term road maps. Many organizations make the time commitment amorphous by talking about vague, never-ending career ladders. But professionals no longer commit themselves to a single company for the bulk of their careers. With each new generation of professionals, the number of organizations and even careers has increased. So rather than fight it, embrace the fact that people will leave, so long as they leave to do something amazing. What I’m interested in is the potential: if you have that potential, we all win and we all grow together, whether your biggest successes come with my team or somewhere else. Finally, this criteria is mutual. A new hire won’t do something amazing, now or in the future, if the organization he or she works for doesn’t hold up its end of the bargain. The organization must provide a platform and opportunities for the individual to be successful. Throwing a new hire into the deep end and expecting success doesn’t cut it. Similarly, the individual must make the company successful to elevate the platform that he or she will launch from. I’m proud of what we’ve accomplished in building the LinkedIn data team. However, when we started, it didn’t look anything like the organization that is there today. We started with 1.5 engineers (who would later go on to invent Voldemort, Kafka, and the real-time recommendation engine systems), no data services team (there wasn’t even a data warehouse), and five analysts (who would later become the core of LinkedIn’s data science group) who supported everyone from the CFO to the product managers. When we started to build the team, the first thing I did was go to many different technical organizations (the likes of Yahoo, eBay, Google, Facebook, Sun, etc.) to get their thoughts and opinions. What I found really surprised me. The companies all had fantastic sets of employees who could be considered “data scientists.” However, they were uniformly discouraged. They did first-rate work that they considered critical, but that had very little impact on the organization. They’d finish some analysis or come up with some ideas, and the product managers would say “that’s nice, but it’s not on our roadmap.” As a result, the data scientists developing these ideas were frustrated, and their organizations had trouble capitalizing on what they were capable of doing. Our solution was to make the data group a full product team responsible for designing, implementing, and maintaining products. As a product team, data scientists could experiment, build, and add value directly to the company. This resulted not only in further development of LinkedIn products like PYMK and Who’s Viewed My Profile, but also in features like Skills, which tracks various skills and assembles a picture of what’s needed to succeed in any given area, and Career Explorer, which helps you explore different career trajectories. It’s important that our data team wasn’t comprised solely of mathematicians and other “data people.” It’s a fully integrated product group that includes people working in design, web development, engineering, product marketing, and operations. They all understand and work with data, and I consider them all data scientists. We intentionally kept the distinction between different roles in the group blurry. Often, an engineer can have the insight that makes it clear how the product’s design should work, or vice-versa — a designer can have the insight that helps the engineers understand how to better use the data. Or it may take someone from marketing to understand what a customer really wants to accomplish. The silos that have traditionally separated data people from engineering, from design, and from marketing, don’t work when you’re building data products. I would contend that it is questionable whether those silos work for any kind of product development. But with data, it never works to have a waterfall process in which one group defines the product, another builds visual mock-ups, a data scientist preps the data, and finally a set of engineers builds it to some specification document. We’re not building Microsoft Office, or some other product where there’s 20-plus years of shared wisdom about how interfaces should work. Every data project is a new experiment, and design is a critical part of that experiment. It’s similar for operations: data products present entirely different stresses on a network and storage infrastructure than traditional sites. They capture much more data: petabytes and even exabytes. They deliver results that mash up data from many sources, some internal, some not. You’re unlikely to create a data product that is reliable and that performs reasonably well if the product team doesn’t incorporate operations from the start. This isn’t a simple matter of pushing the prototype from your laptop to a server farm. Finally, quality assurance (QA) of data products requires a radically different approach. Building test datasets is nontrivial, and it is often impossible to test all of the use cases. As different data streams come together into a final product, all sorts of relevance and precision issues become apparent. To develop this kind of product effectively, the ability to adapt and iterate quickly throughout the product life cycle is essential. To ensure agility, we build small groups to work on specific products, projects, or analyses. When we can, I like to seat anyone with a dependency with another person in the same area. A data science team isn’t just people: it’s tooling, processes, the interaction between the team and the rest of the company, and more. At LinkedIn, we couldn’t have succeeded if it weren’t for the tools we used. When you’re working with petabytes of data, you need serious power tools to do the heavy lifting. Some, such as Kafka and Voldemort (now open source projects) were homegrown, not because we thought we should have our own technology, but because we didn’t have a choice. Our products couldn’t scale without them. In addition to these technologies, we use other open source technologies such as Hadoop and many vendor-supported solutions as well. Many of these are for data warehousing, and traditional business intelligence. Tools are important because they allow you to automate. Automation frees up time, and makes it possible to do the creative work that leads to great products. Something as simple as reducing the turnaround time on a complex query from “get the result in the morning” to “get the result after a cup of coffee” represents a huge increase in productivity. If queries run overnight, you can only afford to ask questions when you already think you know the answer. If queries run in minutes, you can experiment and be creative. Interaction between the data science teams and the rest of corporate culture is another key factor. It’s easy for a data team (any team, really) to be bombarded by questions and requests. But not all requests are equally important. How do you make sure there’s time to think about the big questions and the big problems? How do you balance incoming requests (most of which are tagged “as soon as possible”) with long-term goals and projects? It’s important to have a culture of prioritization: everyone in the group needs to be able to ask about the priority of incoming requests. Everything can’t be urgent. The result of building a data team is, paradoxically, that you see data products being built in all parts of the company. When the company sees what can be created with data, when it sees the power of being data enabled, you’ll see data products appearing everywhere. That’s how you know when you’ve won. Companies are always looking to reinvent themselves. There’s never been a better time: from economic pressures that demand greater efficiency, to new kinds of products that weren’t conceivable a few years ago, the opportunities presented by data are tremendous. But it’s a mistake to treat data science teams like any old product group. (It is probably a mistake to treat any old product group like any old product group, but that’s another issue.) To build teams that create great data products, you have to find people with the skills and the curiosity to ask the big questions. You have build cross-disciplinary groups with people who are comfortable creating together, who trust each other, and who are willing to help each other be amazing. It’s not easy, but if it were easy, it wouldn’t be as much fun.